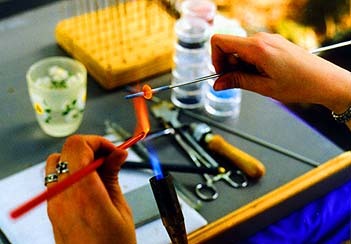 Lampworking is an ancient process of making glass beads (or vessels or other objects.) 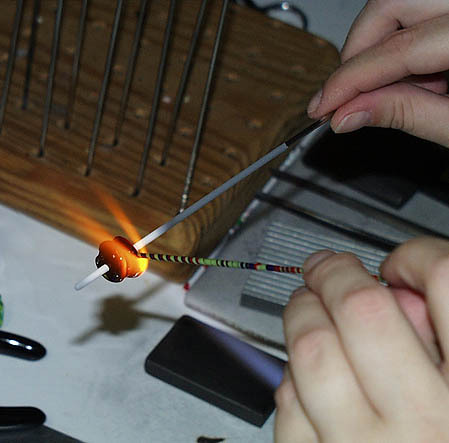 The process involves heating colored glass rods over an oxygen/propane torch and winding them around a piece of stainless steel that has been coated in a bead release. The stainless rods are called "mandrels" and the bead release is a clay-like substance that prevents the glass from permanently adhering to the metal. 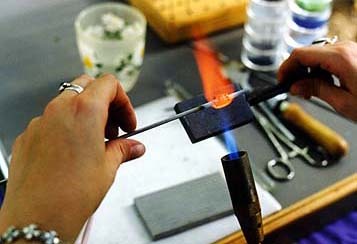 Additional layers of glass, metal foils, enamel powders, frit or other substances are added for decoration. Once the bead is finished, it goes into a pre-heated kiln to cool slowly. The slow cooling is called "annealing" and it's what keeps the glass relaxed and happy so that my beads are very strong and break resistant. After the beads are cool, they are removed from the mandrel, the holes are cleaned and then they're ready for stringing. Making beads is an incredibly addictive pursuit. I am constantly learning and trying new ideas and techniques. Each of my beads is hand crafted, one at a time, by me. No molds, jigs, dies or methods of mass production are ever used, so you can be sure that any bead you get from me is handmade and a one-of-a kind piece.